My home office has come a long way from the bend in the hallway where I used to work. And now it’s time to take the next step. Why build my own home office, when I’ve got a perfectly good bedroom in the house that will do? Well, there are a few reasons. But they might all boil down to one reason: we home school our four kids. That means that a) we have kids and b) they’re home all day. To drive the point home, the oldest three are boys and if not kept completely occupied they will yell and scream, either while playing together or fighting together. So yeah, it’s loud in the house. A bedroom upstairs just doesn’t block out the sound. Sure, I use background noise, listen to music, and keep the door shut. So I’ve tested the sound qualities of the new office. It’s a garage bay separated from the house by an insulated wall. In addition, on the home side, the wall has built-in shelving and a fireplace, providing additional sound protection. I’ve had the kids sit in our family room and yell while I listened from the garage bay. I can hear them, barely. It’s ten times better than the bedroom I work from now. 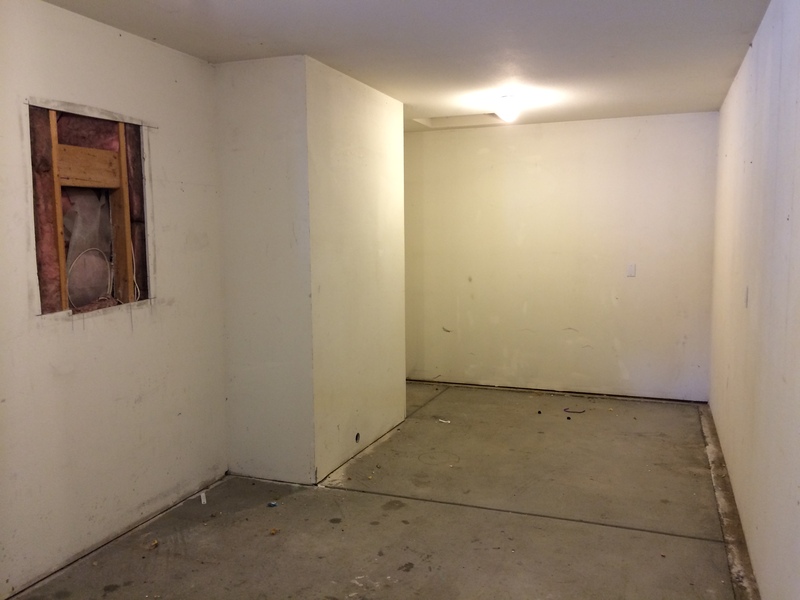 Well, I’ve had four contractors come by to give me bids for the work to turn our garage bay into a home office. Three of the four eliminated themselves pretty easily. One emailed me before getting a bid back to say that he was bowing out. One wouldn’t give me an estimate – he works primarily in commercial, but does residential only on recommendation by family and friends. A third sent me an excuse for not getting an estimate within the week, and now, two weeks later, hasn’t communicated since. But my first estimate was from a guy I’d helped move a year ago, and he’s been responsive to my questions and ideas. He’s busy, so he hasn’t been able to start yet, but I feel confident that he’ll do a good job. The process of getting multiple bids from different contractors was good. I was able to discuss the unknowns with four different people who all approached them from different perspectives. One big unknown for me was how to handle heating and AC. We live in Boise, ID, where it’s hot in the summer and cold in the winter. Of the four different contractors, I got three different approaches to the AC/heating problem. One recommended a window AC unit and baseboard heating. Two recommended pulling a duct from the home system. Another recommended a mini-split system. Each approach had its pros and cons: initial cost, efficiency, control. I actually liked all three ideas well enough, so this wasn’t a deciding factor. I could probably convince the contractor I have to go with any of the three, but I’m sticking with his recommendation of a mini-split system. Though the up-front cost will be a little higher, it should be the most efficient, won’t put extra load on our home AC/furnace, and it will give me more control over the office temperature, independent of the home. The fact that we can crowd the whole family into the office when our home AC inevitably goes out is also a nice benefit. So, having picked a contractor and worked out the HVAC plan, the next step was clearing the garage bay. It was still full of random stuff from our move last summer, as it became the default storage room for the house. Actually, the process started before the contractors came. I began by moving stuff piecemeal over a few weeks. Once it was clear enough for the contractors to come in, move around, and look things over, I did that, and continued the piecemeal clear out. Then, last Saturday, I spent a few hours moving all the rest, taking down wall mounted shelving, etc. The only thing remaining to do is sweep it out before actual work begins. And that’s where I’m at now. Do you work from home? Or are you a remote worker? The answer may surprise you. I got interested in the different terms we use to discuss remote work/ distributed work/ telecommuting/ working from home while watching Office Optional. Sarah Milstein kicked things off and in her opening remarks she pointed out that we don’t have a common language for discussing the “office-less” work that so many people do. I shared my initial opinion on twitter during the Office Optional livestream. But I realized that in order to come up with some scientific answers, research was required. Let’s turn to that source of all modern knowledge: Google. Note: All searches were done in an incognito session, in an attempt to get less biased results. At a glance, it should be obvious that people who work from home are mostly women. Remote workers are primarily men. Google said so. As you can see, remote workers don’t have kids. People who work from home do, but only if they’re women. That must mean I’m neither a remote worker nor a work-from-home-er. Maybe I do “distributed work”? Well, if so, then I’m a 3D model that vaguely resembles a human, and may be differentiated from other 3D quasi-humans only by color. We communicate via 3D arrows. Aha, maybe I’m a telecommuter? No, telecommuters are primarily cartoon characters, often from Dilbert. At least here, men and women, the real ones, not the cartoons, seem equally represented. Also, they’re all dressed, whereas the cartoon characters have about a 33% chance of being in some state of undress. Thinking back on the last week, that ratio sounds about right. 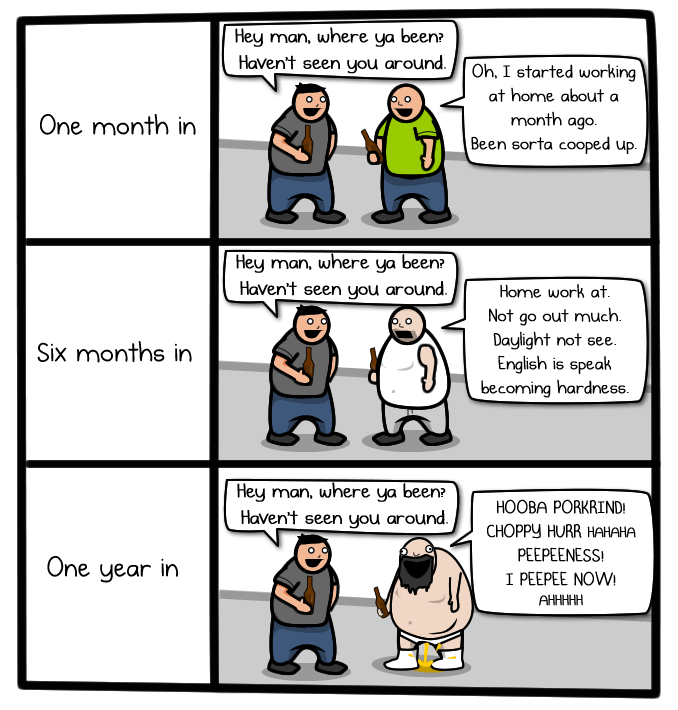 I also noticed that The Oatmeal got itself a cartoon on the first page of image links for both the “work from home” and “remote work” searches. 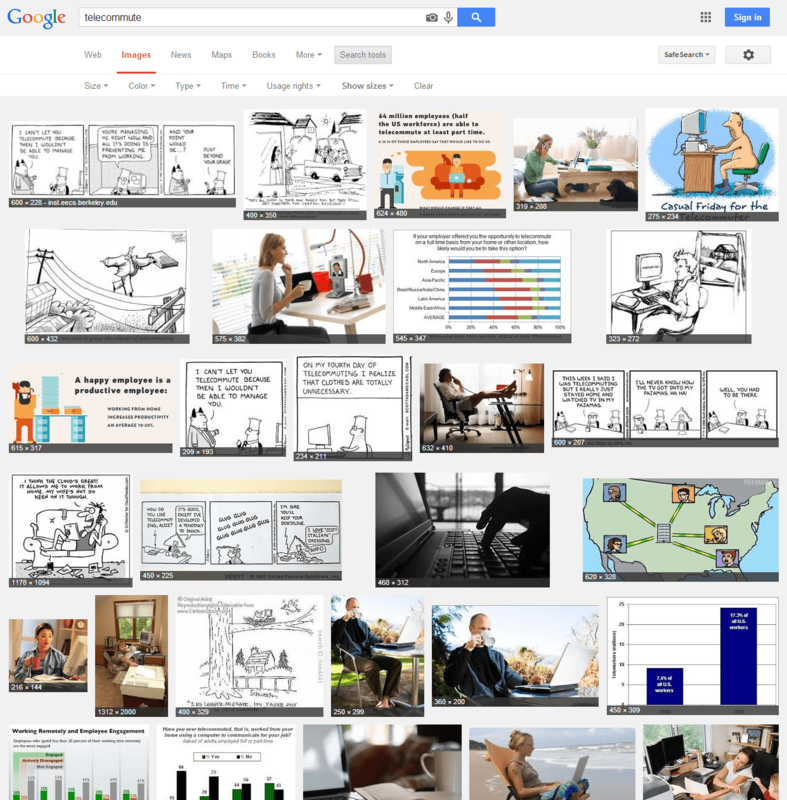 Though the “worker” in both cases is a man, it’s shouldn’t be surprising that the cartoon with a woman showed up on the “work from home” search. Both are from this The Oatmeal post. Warning: The Oatmeal is crass, crude, and vulgar, in case it wasn’t obvious. From the chart, it’s clear that “work from home” is the most popular term. But it’s popularity has been waning over the last ten years. “Remote work” is the upstart, and seems to have replace “telecommute” over the last ten years, with definite gains since 2008. It appears that at the same time each year “work from home” searches drop and “remote work” searches surge. Not sure what’s going on there, but it would be interesting to study further. 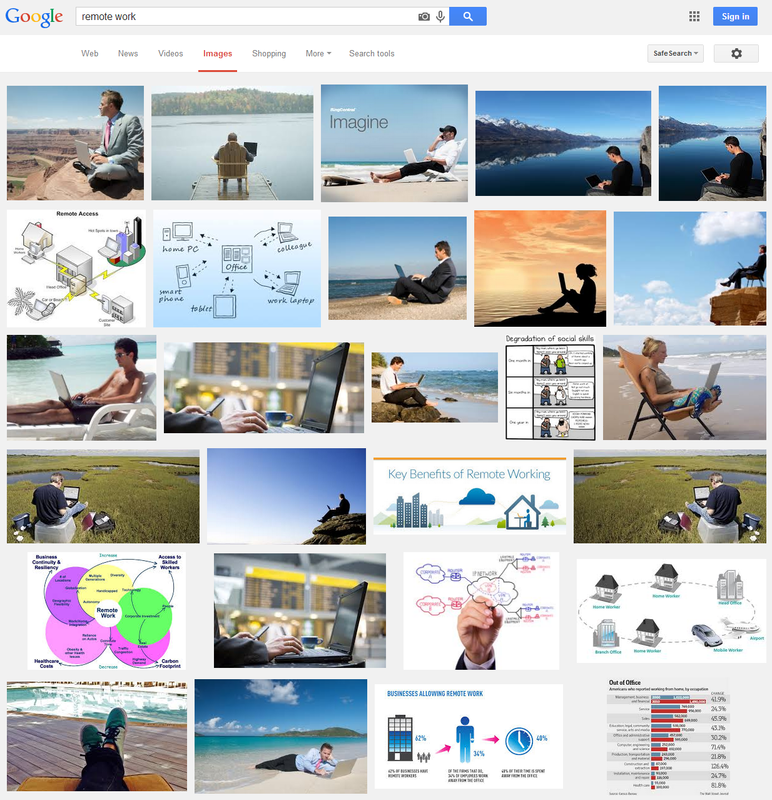 Finally, we can look at the regular web results for each search. Here, both searches include links to job listings: career builder, indeed, etc. “Remote work” points to some other smaller sites like weworkremotely.com and skipthedrive.com. The weworkremotely.com link isn’t suprising, because the first link on that page is to the 37 signals book, Remote. 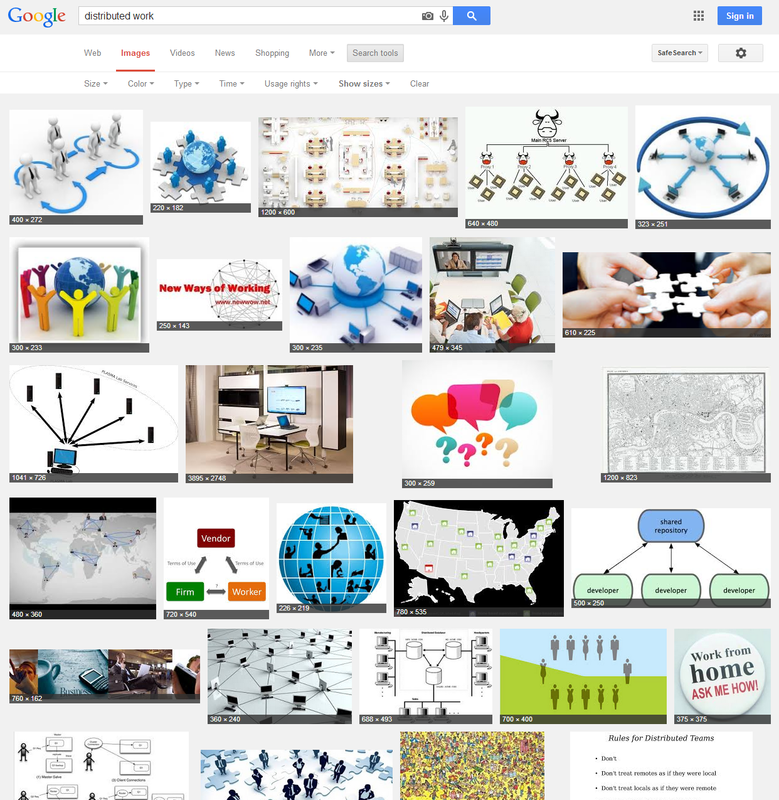 “Work from home” has more big-name job search engines: Simply Hired, etc. It also has how-to type articles, one at womenforhire.com, and another at bankrate.com, of all places. 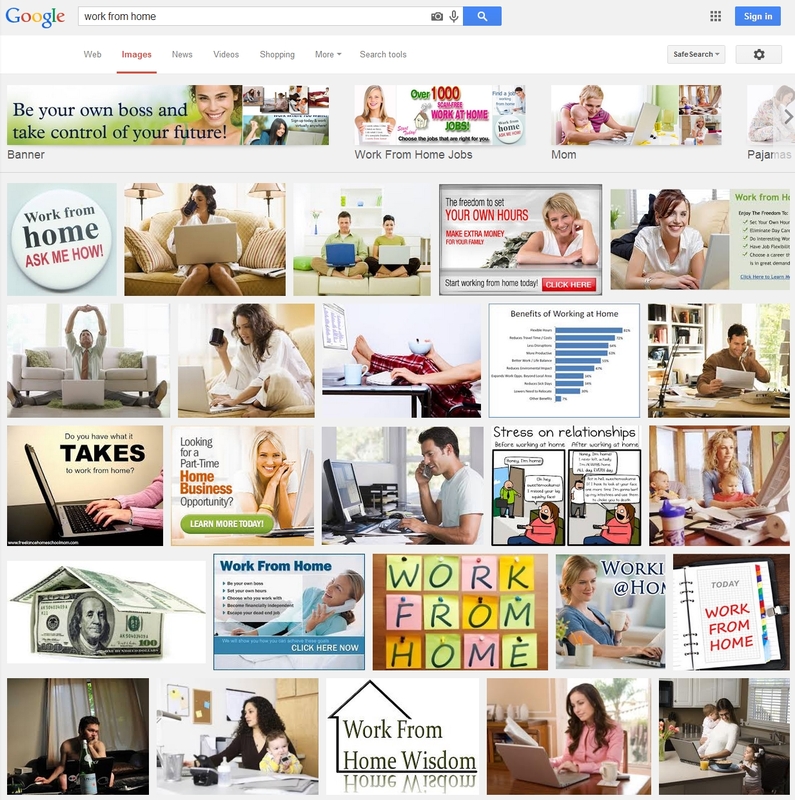 The “remote work” search includes a link to the Wikipedia article on telecommuting, while the “work from home” search has the Wikipedia article on work-at-home get rich quick schemes. Hm, I’m not sure I have any conclusions. Solving this problem by adding a new term seems like a horrible idea. But none of the existing terms are all that useful. Yeah, I “work from home”, but not everybody who doesn’t have an office to go to does. I’ve talked to testers who use cell data plans and roam the country in RVs. And while I like the term “remote work”, the fact is that at a company like Articulate, where everybody is “remote”, then you have to ask what are we remote from? Not a central office. Telecommute might make sense if I spent my days on the phone. I’m more of a ‘net commuter. I commute to our team “office”, i.e. the Storyline HipChat lobby, via my internet connection. I share my work via the net, I talk with my team via the net, my work is organized on the net. But seriously, let’s all stick with “remote work”. So, now that you know the science, what are you? A remote worker? A telecommuter? Or do you work from home? Many others have offered up their summary reports on Office Optional, the new conference on distributed work put on by the Lean Startup guys. This is going to be my biased, incomplete, and opinionated summary. It’s biased because I’m coming at it from a certain angle – that of a remote worker trying to get better at what I do. So I’ll go light on some of the HR stuff and “big ideas” talks that were outside the scope of what I face on a day to day basis. It’s incomplete because, even after just covering the stuff I’m biased to cover, I’m still going to have to leave stuff out. I’m not going to go super deep in this post, but will do that later in other blog posts on particular talks or themes that came out of the conference. And finally, it’s opinionated. My first opinion is that it was a great conference, and I hope the Lean Startup Foundation keeps it going. I’ll also be offering some suggestions on what could be improved, and feedback on some of the talks themselves. So let’s dive right in and look at the themes of the conference. The themes I cared about and tuned into were Collaboration, Communication, Tools, Self-Management, and Human Resources. The conference kicked off, after Sarah Milstein‘s initial remarks, with an awesome talk about the modes of collaboration by Teryn Rikert. She outlined three, increasingly complex modes of collaboration: informative, evaluative, and generative. Each mode involves some primary activities. For example, the informative mode is about asking, telling, showing, and responding. For livestream participants in Office Optional like me, this was the primary mode of the entire conference. I was learning, sharing what I learned and asking questions. The evaluative mode is all about challenging, defining, commenting, revising. This mode tends to be iterative and is about taking something and improving it. The most complex, and most valuable mode of collaboration is generative. In this mode, people are brainstorming, building, synthesizing, and capturing creation. Tools exist for enabling the different activities that make up these modes of collaboration, both for remote workers and for those in traditional offices. Teryn could have easily gone on to discuss these tools, and what they should look like for remote workers, and the talk would have been excellent. Instead, she went deeper by examining what actually makes collaboration work: trust. The activities of collaboration become much more powerful when the participants have high trust. And certain behaviors embody and build trust in each mode of collaboration. Tools can solve the problems of letting remote workers see, hear, and talk to one another. But for true collaboration, they need trust. And trust is built up by certain behaviors. In the informative mode, trust is built by revealing, pausing regularly, so participants can ask, checking on progress, and inquiring. You trust the professor who does those things more than the one who just lectures. In the evaluative mode, trust is built by reiterating others ideas, clarifying, focusing in, and eliciting feedback and input. In the generative mode, trust is built by aligning participants, facilitating involvement and creation, summarizing ideas and progress, and highlighting everyone’s contributions. And so, rather than looking at the tools with respect to how they enable the activities of each collaboration mode, we can look at how well they enable the activities that build trust in each mode. Building trust in those modes is important when you’re in person, but absolutely vital for distributed, remote teams. Joe Moore followed Teryn up by talking about one of the most intense forms of generative collaboration, remote pair programming. He emphasized using both screen sharing and video chat to build trust and ensure communication is as high bandwidth as possible. It made me miss the great pair programming I did at TrackAbout a little bit. One thing I’ve learned over time is that certain tasks lend themselves very well to pair programming, while others are just not a good fit. The Storyline team has been working on a lot of UI heavy stuff recently, and it doesn’t feel like a task well suited to pairing. Other features we’ve done for our upcoming release could have really benefited (and in some cases did) by pairing on the code. A little later in the day William Donnell walked us through how they do brainstorming at Sodium Halogen using video chat. Although the discussion was tools focused, it was in the service of generative collaboration. The key, in his mind, was to provide as much video as possible, giving remote participants a full view into each other’s workspaces and whiteboards. Both Cheryl Contee and Chris Byers discussed the value of culture, trust, context, and purpose over tools as well. For remote organizations to work well together, they need good culture, a context of shared purpose guiding them, and trust among team members. Without those, the best tools are not going to make the work any easier. There will be confusion, frustration, and lack of trust limiting all of the collaborative work they are attempting. With those, the productive work can get done even with suboptimal tools. Chris focused on the value of a shared purpose that everyone knows. This common shared purpose and mission gives employees the ability to work independently and autonomously to achieve it, which is a necessity when they’re working independently and autonomously through remote work. Cheryl discussed a variety of important cultural behaviors that build trust and establish a culture. Things like hiring slow and firing fast, celebrating birthdays, allowing flexibility for remote workers schedules, a yearly team retreat, always assuming good intentions of your coworkers and employees, etc. None of these behaviors are specifically about collaboration, but they grease the skids, making collaborative work more productive and possible. For me, the highlight of the discussions around communication was David Yee‘s talk on group chat. He first pointed out that a shared group chat room is the “office” for remote workers. It provides a common area for us to talk, shoot the breeze, discuss both work and personal stuff, kick off deeper conversations, and create a common culture. Group chat is the solution to many of the standard problems of remote teams: having group conversations, limited shared time together, employees feeling isolated, a lack of “benevolent eavesdropping” that leads to serendipitous collaboration. He pointed out that group chat is your office, it’s the common area at the heart of your company or team. Everyone has their own office, and group chat is the common areas, the water cooler, the hallways connecting them all. He then went on to discuss ways to use it more effectively. First, show up. That means logging in to your chat app, whether it’s HipChat, or Slack, or Campfire. Second, use it. If you need to talk with coworkers, put it in your chat room. There are advantages to persisted searchable chat that you give up when you pick up the phone. Conversations can go on and be picked up by people who weren’t at work when they started. Others can read through past conversations to know what’s going on, even if they don’t have anything to add. Next, say hello. When people say “hello” upon starting their work day, and say “goodbye” when they leave, it sparks conversations, it shares your work rhythms, and creates a shared team or company rhythm, just like in person offices have. Fourth, use chatbots. They can make chat more fun, easier to use, and inspire discussion based on automatic events, like tweets about the company. Finally, start with the lobby. If you’re not using group chat, just create one room, a lobby, for common use by the team. If you do have group chat up, default to having conversations in the lobby. The transparency that provides is healthy for a team, and allows for the benevolent eavesdropping that more easily happens in co-located offices. The next session on communication that really struck me was Sieva Kozinsky‘s talk about how daily meetings can transform a distributed team. This struck a chord with me because on the Storyline team we’ve been experimenting with our daily status meeting to try to improve things. Over time it had become challenging. It lasted too long, had too many people in it, and became something I zoned out in. After some discussions, we agreed to only have it when there were people who had something to share. That’s presented its own set of problems, and I’m not really happy with the result there either. Sieva’s talk emphasized that a good daily meeting should be like a good habit, rather than a chore. A good habit, like brushing your teeth, is something you do daily, and it leaves you feeling good. A daily meeting can become a good habit if you make it quick, easy to participate in, and relevant to the whole team. I think our biggest challenge on storyline is just how big the team is. With a smaller team size (maybe do the daily meetings at a smaller granularity), they would be shorter, everyone could update each other on what they were doing and would do, and because the team is primarily composed of people you work closely with, the updates people share are more relevant to you. One other key part of the habit for Sieva’s team was that someone would share their screen during the meeting with notepad open and just type in a summary for each person of what they had done during the last day and what they would do in the next day. This pressured people to be realistic about their plans because there was a little accountability to the team in what they said. As an alternative to, or in addition to, daily meetings Sadie Honey and Aaron Pava outlined their weekly meeting agenda. These lasted longer than a typical daily meeting and were at a higher level. The first step, which only takes a few seconds, is to have everyone share their “balance score”, which is a score from 1 (life) to 10 (work) indicating whether their work/life balance was tipped more towards work or life. This was then tracked so team and company leadership could keep an eye on things, while expecting natural fluctuations. The next step is to have each team share a 30 second updates on what the team is doing with the company. Then everyone who wants to can share something they are excited about, wondering about, or worried about. Finally, they wrap up with a 10-15 minute talk on some topic. These topics are chosen in a quarterly meeting where everyone brainstorms different topics they’d like to hear discussed. They could be anything from how/why the company is run the way it is, to technical talks. All of these components of the weekly meeting seemed like interesting ideas worth trying out on my own team. The continued to discuss other cultural aspects of their company that sounded fun. I hope to share more of those in another blog post. In the category of tools, one discussion stood out, despite the taste of salesmanship that came across. Though Patti Chan‘s talk eventually became a pitch for Houston, an open source project created by her company, Intridea, it began with some intriguing thoughts about the evolution of tools for distributed work. After beginning with a review of the tools that her team uses, she went on to categorize them broadly as either tools for storing and disseminating information, or tools for talking to each other. She imagined an uber-tool in each category. For storing and disseminating information, a Frankenstein-ian hybrid of GitHub, Dropbox, and Google Docs. For talking with each other, a similar hybrid of Skype, Hipchat, GotoMeeting, and Yammer. Though my initial thoughts were that single purpose tools will win out, and big complex apps like she imagines are ripe for disruption by smaller, quicker competitors, it’s not surprising that we see the tools actually moving in the direction she laid out. Skype just added free group video calls, Hipchat recently added video/audio calling to its chat app. GitHub is constantly building out new and interesting ways for storing and presenting the data that people keep in Git. And Dropbox definitely has the vision that could make it the sole repository of information for companies and individuals in the future. Whether or not it’s possible for a single app to become the communication or information hub for a distributed company, many apps are definitely trying to achieve that goal. And I know that having less tools to deal with feels good to me, as a remote worker. I’ve been arguing for a while that our team needs to track its bugs and its feature work in the same tool. And the disconnect of communicating on Skype one minute, HipChat another, and GotoMeeting later in the day is frustrating. I’d love to have a single experience. It also seems reasonable to assume that all of the disruption that has been occurring due to internet technologies over the last couple decades will have to taper off in time. It causes a certain amount of learning fatigue, and there is definitely value in being able to concentrate on getting work done, and not living on the hamster wheel of learning new tools only to discard them and move to the next shiny thing that comes along. It may take years, or even another couple decades, but I believe that our cost/benefit analyses will lead us increasingly to keep the tools that we have over switching to others for minor gains, especially as those tools fill in the gaps in their feature sets. Honestly, I’d rather have HipChat add Sqwiggle as a feature, so that people’s avatars just update with webcam shots every few minutes, rather than having to use both HipChat and Sqwiggle. I’d also love to be able to handle screen sharing, audio calls, and video calls al through the same app, and, for company related business, have all of those recorded and archived, just like chat is. Besides Patti’s thought-provoking talk, much of the focus on tools was on individual tools that people could use. Some tips and tricks came out of that, as well as some new tools I hadn’t previously heard of, like Murally and Popplet, which both seemed interesting and useful within their domains, even though I don’t often work in those domains. Lynne Johnson began by asking the four panel members (herself included), what their daily rituals consisted of. Each person had a different schedule, with different challenges. Three of them spent time with their kids in some significant way each day, which is a recurrent theme among those I’ve talked to and worked with who love remote work. That said, Elisa Batista mentioned the challenge of being fully present with the kids, since when you’re at home you’re in your work environment, and it’s hard to turn that off without the reset that comes from a commute home at the end of the day. Because of this she mentioned the importance of having a separate workspace within your home. That separation can help you be more focused on work when you’re working and more focused on family when you’re not. Two of the four admitted to regularly working in their pajamas. I regularly work in my gym clothes after a morning weights or running session, so I can relate. For Keith Fahlgren, daily habits are a key to his productivity, and one of those is his morning shower, so no PJs for him. He also mentioned the importance of checking in on the company chat room by saying good morning when he started work, which was impressive since he got up at 5 am and did a couple hours of work before getting his kids off to school each day. Lynne also avoided pajama work because she almost always worked away from home, at coffee shops, co-working spaces, etc. She liked the regular change that came from working in different places, but did admit to missing a workspace that was all her own, set up just the way she wanted it. She had one, but worked out and about enough that she missed it. Each of them also had little tips to be more productive. Raina Kumra offered a fun tip for those who were one of the only remote workers in their company: have a mole in group meetings who could text you about nonverbal reactions and other things you miss by not being there in person. Keith encouraged remote workers to expect their company to pay for the tools needed to do company work productively (I’m really grateful that Articulate encourages us to expense everything we need to work effectively). Elisa and Raina both mentioned the importance of time trackers, not just when doing billable work, but also to keep productive. RescueTime and Harvest were mentioned. All of that was great, but, as I said, I would have loved to have more talks and discussion on the topic of self-management. A final theme for the conference was a focus on human resources: issues around interviewing, recruiting, onboarding, management, and the overhead of processes and team organization. It would be unjust not to kick off my review of this section by starting with anyone other than Articulate‘s own COO, Frazier Miller. He began by looking at the “psychographics” required for remote work. In other words, how to find people with the right mindset, personality, and approach to work for doing remote work. At the level of hiring and onboarding people, you need to find employees who can motivate themselves, stay focused, and work without the human interaction that an office provides. Articulate has learned that sometimes that means letting employees find you and your company, rather than going out and trying to find them. Too many people are recruited by distributed companies and get the wrong impression of remote work. It’s not a day on the beach, it’s a messy home office with family interruptions to deal with. Once you’ve found the right people, having an onboarding process is important, especially as the company grows. Part of that onboarding process at Articulate includes the annual company retreat and also team inception get-togethers. We’ve still got work to do there, as I’ve been at the company more than a year and never been to a team inception face to face. I’d really like to see these happening 1-2 times a year, in addition to the annual company retreat, which we had back in October and was awesome. Some other improvements that Frazier wished we could make as a company was to use more video when doing calls and chats, both individually and in groups, and an Apple Pie as a Service. It would be nice to more easily recognize and appreciate employees, from something as simple as a pie on their birthday, to more formal rewards. In an office that can be easier, but it’s not always easy to do with a remote workforce. Not only does everyone live and work in different places, but because of that, we don’t really have an office admin (there’s no office to administer. Administrate? ), who would typically handle things like that. It certainly seems like something that an enterprising person/company could turn into a business for distributed teams. Before Frazier spoke, the Automattic team had a couple people talk about some of the lessons they had learned on an even larger distributed workforce. The most interesting idea from that discussion, for me, was that they hire everyone on contract to do a 4-6 week project in their free time as part of the interview process. I’ve heard many say they like this idea in the past, so it was cool to hear how it’s actually working at a good sized company. This helps them not only find people who can do good work, but who can do good remote work. Because it’s a paid project, the potential employee gets something out of it, even if they ultimately decide working from home is not for them. Although there were other talks about HR, the last point that really struck was from the day’s closing discussion with Bob Sutton and Eric Ries. When talking about the need for process and hierarchy as an organization grows, Bob talked about a small company, Pulse, that started to fall apart when they got to 11 employees. They had been productive up to that point, but at that point nothing was getting done, there was fighting going on. They solved the problem by dividing into 4 different teams, of two or three people each, with a simple coordination process. Each evening, before leaving work, each team would share what they had accomplished that day, and any questions they had or blocking issues. This simple organization and process allowed them to work much more quickly, and stopped the politics from happening. This resonated with me, because something I’ve seen at both remote companies I’ve been at is that teams need to be smaller. Teams of 2-5 people seem like the sweet spot for remote work. I think co-located teams can grow a little larger, maybe up to 10 or so, before they start to get unwieldy. But remote teams of more than 6 or 8 leave people feeling disconnected, hidden, or able to hide, in large group calls, and less accountable to one another in their shared goals. As the day wrapped up, my mind began to turn to the next Office Optional conference. I fully expect that the caliber of speakers will be even better than this year. I called out some of my favorite talks above, and many others were good, but not necessarily applicable to me. There were some disappointments as well, talks that I felt could have been better with the right presenter, or where the subject matter was just unhelpful, or where a simple idea was spun out into a talk that ultimately had a low signal to noise ratio. If at all possible, I’d love to attend in person. Though I was able to share tips and questions as a livestream participant, the fact is that none of my tips or questions got shared or asked during the conference. My primary participation, outside of watching it, was by tweeting quotes I liked. It would have been fun to be there, to chat with fellow attendees and speakers during the breaks and at lunch. There is definitely a time and place for in person meetings, and Office Optional is one of those times and places.